In an article published in the April 24 issue of Sciences, researchers describe how they applied a computational process called “comparative entropy” to a corpus of ancient Indus Valley Script texts. The results of the analysis show a kind of patterning they argue is only found in glottographic, or speech-based, writing systems. 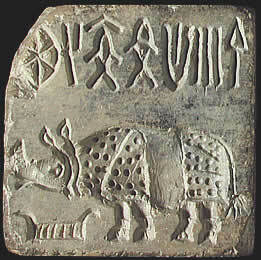 The complex Indus Valley civilization flourished from 2,600 to 1,900 B.C. and left hundreds of engravings on seals and tablets — writings which have yet to be deciphered. Members of the AAAS can read the Science article online here. Otherwise this Asia Times Online article has a summary that describes historical attempts at identifying the script that would rival the storied Rosetta Stone.